Thanks very much Tan, that's brilliant. Sorry Leigh Done now. I thought it was and didn't realise it wasn't!!!!! Thought it should be an open forum to view, not requiring registering as it is hopefuilly a good source of info to those interested in finding out more about FiV especially with the link to the old CC FiV forum until this forum takes off more. Have posted the link to this on the board queries so tan will see it easy. Congratulation on all the excellent work that you have put into the new website, absolutely brilliant and very much appreciated by us all. I was wondering what you think of making the FiV/FeLV forum open to guests to view like the General forum as it was this way that I stumbled originally on the FiV forum on CatChat whilst searching for info on FiV when adopting Alfie. 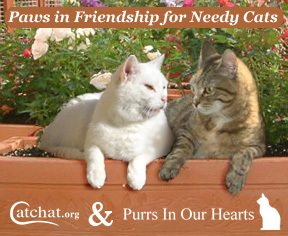 I have posted a link to the CatChat FiV Owners Club forum which is read only but still contains a wealth of info on FiV/FeLV and caring for such cats. Hopefully, in time, the new forum will build up but for the time-being I'd like to think that it is readily accessible to new visitors and contains a link to existing postings on CC.